First, the good news. Yesterday evening was the 60th Phidian Art Show in Dixon, Illinois. As mentioned in previous posts, this Art Club (which I am a member) is over 100 years old, founded by the women of Dixon and surrounding areas to support and advocate all forms for the fine arts. 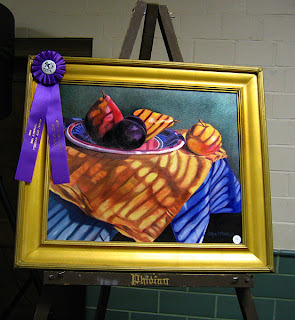 Last evening I received the Best of Show for an oil still life titled, "Venetian Shadows."(above). This is the 2nd time I have been honored with this award. My friend Debbie received the Creativity Award. In fact, we both won the same award two years running. So with award checks in hand, we and the husbands went out for a late dinner and couple of brews! Good news #2: I sold another painting last night. The customer is from Atlanta. She has purchased from me before. 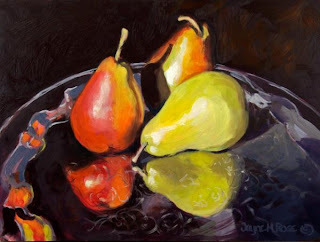 She was dining at our restaurant on Easter and saw "Pears on a Silver Tray"(above) hanging there. So, she called yesterday and said to bring it to the Phidian Show. Good news #3: Jeff and I are leaving on a 4 day vacation this Sunday to Ashville, NC. Our daughters gave us this trip for our 25th wedding anniversary. Didn't we raise 'em right? The bad news, you ask? Well as I type now, it is snowing and actually sticking to the ground. This is so wrong on so many levels. The Cubs game has been canceled. That's okay, they just break my heart on a yearly basis anyway.